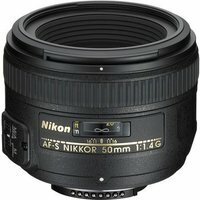 The Nikon AF-S 50mm f/1.4G lens is a fast, fixed focal-length Nikkor lens with a built-in Silent Wave Motor (SWM) to enable smooth and quiet autofocus. The high-quality optical system delivers fantastic image quality, minimising both flare and chromatic aberration. Ideal for portrait photography, general use, and video recording, this lens has an ultra-fast maximum aperture of f1.4, with a unique rounded 9-blade diaphragm for smooth, natural bokeh.